1. What is bike share? Bike share is a public bike system for short trips. You can use any of the bikes in any dock any time, 24 hours a day, 7 days a week, all year. The system uses special bikes that lock into docks placed around in many locations throughout downtown Los Angeles — every couple blocks. The first pilot phase of Metro Bike Share is in downtown Los Angeles, where there will be up to 65 stations. The above map shows the location of stations; a dynamic version of the map is here. Download our Metro Bike Share app for a real-time map of available bikes and locations of docking stations. 3. Where do I lock up the bike? At the Metro Bike Share station nearest your destination — and there are stations close to most destinations. If you don’t dock the bike, the clock keeps running on your tab. If you’re not riding, just dock it. 4. How do I use Metro Bike Share? To use a bike after purchasing a pass, simply tap a TAP card to the dock to unlock the bike. Ride to your destination and then return the bike to the nearest dock. Main Street between Cesar Chavez and Venice Boulevard (the stretch between Cesar Chaves and 9th is for northbound riders). Springs Street between Cesar Chavez and 9th Street (for southbound riders). Olive Street between 7th Street and Washington Boulevard. Grand Avenue between Wilshire Boulevard and Washington Boulevard. Los Angeles Street between 1st Street and Alameda Street — the lane begins/ends right in front of Union Station. 2nd Street between Spring Street and 1st Street. 1st Street between Beaudry Avenue and San Pedro Street. 3rd Street between San Pedro Street and Santa Fe Avenue. 7th Street between Main Street and the 110 freeway (and beyond, all the way to Catalina Street). Figueroa Street between Wilshire Boulevard and Cesar Chavez Ave./Sunset Blvd. 11th Street between Broadway and Wall Street. We strongly encourage riding on the street to be courteous to pedestrians on sidewalks. Remember, even if there is no bike lane, every lane is a bike lane. See this post from LADOT for more information about riding on sidewalks. The bikes and docks have information and instructions on them. If you need further information, please call customer service at 1-844-857-BIKE (844-857-2453) or email at support@bikeshare.metro.net. 5. How much does it cost to ride a bike? For the first month of service, Metro Bike Share will only be open to Monthly or Annual Flex pass holders. The Monthly Pass is the all-you-can-eat option. For $20 per month, you can ride the system as much as you want in 30-minute increments. This is the best deal for those who will be riding three or more times each week. The Annual Flex Pass is the pay-as-you-go option for the occasional rider. For $40 a year, you get access to Metro Bikes for $1.75 for every 30-minute ride. Pass holders must register with a credit card to use a bike (this discourages theft). Your TAP card is then used to quickly and easily unlock a bike at the docking stations. Please see this post for more about TAP cards and Metro Bike Share. 6. What if I don’t have a TAP card? You can get a new one in the mail when you buy a Metro Bike Share Pass. Or get a TAP card at any TAP Vending Machine (at all Metro Rail and Orange Line stations) and then register the card as part of purchasing your Monthly or Annual Flex Pass. There is also the Walk-Up option! With Walk-Up, you don’t need a TAP card to get a Metro Bike. You access the system with a credit card at the kiosk at each station. Walk-Up rates are $3.50 per half hour. This is the best choice for very occasional users and tourists. Pro Tip: If you are a visitor but you plan to ride six or more times during your stay, the $20 Monthly Pass is a better deal. 7. Do I need a helmet? What about lights? Where do I put my stuff? In California, those riding bikes aged 17 and under are legally required to wear a helmet. If 18 or over, helmet use is up to you. If you want to use a helmet, please bring your own. Metro Bike Share does not provide them. The bikes come equipped with lights and reflective paint for night riding. The bikes also have baskets in front behind the big Metro M that can carry a small grocery bag. 8. Are the bikes in good condition? Yes. The bikes are frequently maintained so you don’t have to worry about chains breaking or under-inflated tires. Trust us — the bikes are built like tanks. They are heavy, sturdy, and ride smoothly so you even a novice rider can feel safe over a rough patch of road. 9. Does it work with Santa Monica’s bike share system? Currently, the bikes and docks used by Metro Bike Share and Santa Monica Breeze Bike Share are not interchangeable. So the bikes can’t move between systems. The key to moving between bike share systems is your TAP card. Register it with both systems and you can use a single TAP card to access bikes in both DTLA and Santa Monica. Long term, we’re working towards more integration, so that you don’t have to have multiple accounts. Also, let’s be practical. If you’re intending to ride between Santa Monica and DTLA, you’re going to need a bike for more than 30 minutes. In that case, you’ll probably want a traditional rental bike and something a little more nimble and lighter. That are plenty of bike rental shops in Santa Monica as well as L.A.
10. Why should I ride Metro Bike Share? Number one reason — it’s the most fun way we know to get around. Get on a bike and we dare you not to smile. But practically speaking, Metro Bike Share is meant to make it easier to get around downtown. Ever tried parking in the Arts District? It’s awful. Dining in Chinatown and then heading to the Staples Center? Such a drag. With a TAP card in hand, you can now seamlessly arrive in DTLA via Metro Rail and ride a Metro Bike to your favorite or yet-to-be-discovered dinner spots, coffee shops, art galleries, boutiques, and endless cultural offerings without a car. Tagged as: active transportation, bike lanes downtown Los Angeles, bike team, bike-share, downtown Los Angeles bike share, dtla, DTLA bike lanes, first mile last mile, flex pass, how to pay for Metro bike share, monthly pass, station locations, TAP, where to ride in downtown L.A.
What happens if your bike gets stolen? How do you report it and are you responsible for paying the cost of the bike? If a Metro Bike is stolen while you have it checked out you should call customer service immediately. You will have to make a police report but you will not be financially responsible for a stolen bike. Quote: “…you will not be financially responsible for a stolen bike.” I wish I could get that in writing. Metro Bikes will be deployed to docks throughout the day on July 7. Download the app on the morning of the 7th to see a live map of available bikes. That’s great to hear! Thanks, Julia. FWIW: I’m a Breeze member and I just signed up for a monthly pass for the Metro system. I don’t have a problem with the incompatibility between the systems. Since Bike Share is an evolving technology, both here and throughout the world, I think its good that we get exposed to different operating systems.That way we can learn which elements of each system work better so that we can make rational decisions moving forward. It’s a good position to be in where the worst case scenario could be that both systems are successful, and we eventually have to work to make them compatible. Until then I’ll keep an open mind. Well said! We have a unique bike share landscape emerging in LA. Lots of things to learn from this laboratory. This really glosses over the incompatibility with Santa Monica’s system. That’s a huge negative that should be properly acknowledged. What about when some of the other 88 cities in LA County want their own program? How is Metro and its Board working to ensure there are no future compatibility failures? For a system that prides itself on bikes and transit working together, the solution should have been regional. Metro Bike Share is the regional bike share system. Santa Monica and Long Beach received funding for their bike share systems before the regional system existed so they are special cases. As directed by the Metro Board, staff is working towards a multi-vendor bike share network for LA County. We fully acknowledge the grand scope of the effort. It has never been done before and we are excited to be working towards it. Is the upcoming West Hollywood bike share system part of Metro Bike Share? West Hollywood’s system will not be part of the regional system but it will be operated by the same company running the systems in Santa Monica and Long Beach. FYI, Beverly Hills is also launching the same system as Santa Monica and Long Beach. LA is the only city using a different system. For now bike share and transit passes will be separate but we are working towards making a combined account possible. Yes, please work on incorporating the bike share program into the EZ transit pass for us users who need to use more than one option for our commute. Great start to this program though. We’re getting there! I love this!! The article has lots of writing and grammar typos though.. Author/writers: Please read the entire article carefully and out loud to find the mistakes. Hint: there’s one in #8. What if all docks are full at your destination, and you have nowhere to dock your bike? We have operators in the field to prevent this from happening. But if all the docks are full you can follow the directions at the kiosk to get another 15 minutes. Stations will only be a couple of blocks away from each other so 15 minutes should be plenty of time. 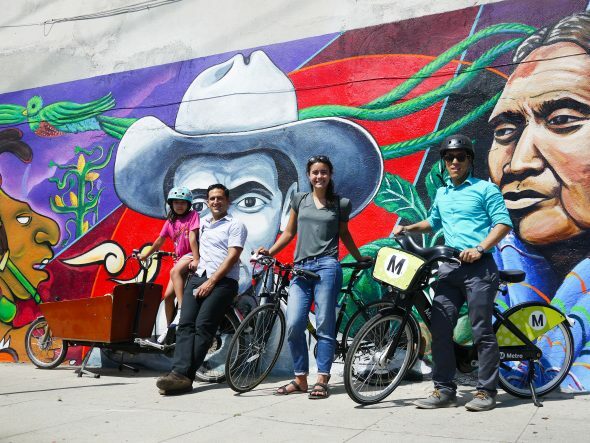 How does the bike share system work for LACMTA employees and their dependents? Employees and dependents have to create an account like every one else at bikeshare.metro.net. Employees received an email with instructions on how to register their Metro Bike Share accounts to their badges. Dependents can use their badges as well using the same process as a regular TAP card. 3.50 for half hour it’s to expensive! Yes, the Walk-Up rate is the most expensive option. Any resident of the area or even occasional user will get a better deal creating an account and buying one of the two passes at bikeshare.metro.net. $240 per year to get a monthly pass in the LA system and $79 for an annual pass for Santa Monica residents in their system. In addition they have student discounts and the freedom to lock their bikes to any public bike lock if the one they are trying to return to is full. Are there going to be discounted yearly options added to the LA System to bring the pricing in line with other systems? Great question. The Santa Monica Breeze annual pass you mentioned only includes 30 minutes of use every day while the Metro monthly pass includes an unlimited number of 30 minute trips. If you ride more than 30 minutes a day on this Breeze annual pass, you will be charged an additional $6/ hr. Breeze also has additional charges if users lock up their bikes outside of the service area or even outside of a designated hub. The fare structures are very different so it is difficult to compare apples to oranges. That said, Metro staff is working on making discounts for students and seniors possible and is already working hard on access for low income residents in partnership with non profit groups. Breeze update: Today they announced that they’re changing their pricing structure so that all monthly and annual passes allow 90 minutes of usage every day. This is a great change and will make that system even more successful than it already is. They also raised the hourly rate from $6 to $7. This is basically the same one-time usage rate as for the Metro system, except that Breeze pro-rates their hourly rate so that you can use the bike as often as you want within the hour, for example six ten-minute rides cost the same as two 30-minute rides. When will the mobile app be ready to download? The app will be available for download on Thursday (7/7) morning. I love visiting LA and I often ride my bike in my home state of Florida. While this sounds great because I can’t really take my bicycle on the airplane, i would definitely like to see more ubiquitous bike lanes with a PHYSICAL BARRIER to protect me from traffic. I don’t want to get killed trying to ride and be healthy. I am from a General Dental office called Downtown Dental LA. We were asked to be in the press for the bikes tomorrow and that we can showcase them in front of our company. We are definitely interested Julia. Can I please have your contact info? Thanks! Staff commented that the Monthly Pass is the most economical option for riders who use Metro Bike Share several times a month. But it sounds like a rider who has taken a bike out from a dock has to re-dock it within 30 minutes each time they use it. If a rider with a monthly pass keeps a bike more than 30 minutes without re-docking it, what does the system charge them for the extra time? Yes, if a Monthly Pass holder has a Metro Bike out longer than 30 minutes at a time, they will incur a $1.75 charge for every 30 minute block. Why can’t I pay for walk up rental with the cash value on my TAP card after August 1? It seems kind of strange that walk ups are discouraged from using transit fare card. Walk ups are intended for visitors who most likely don’t have a TAP card. For residents, Metro Bike kiosks don’t currently have the ability to access your TAP card’s stored value but we are working on that function for the future. I think it’s fantastic, but I don’t like the 30 minute increment. They have the same time allotment in NYC— too short! I also think that the 30-minute time allotment is way too short, and appears to be a money grab. Along with the $40-per-year fee. Come on, Metro. You, the City of Los Angeles, the County of Los Angeles: when are you going to quit nickel-and-diming us to death? Riders are already paying up to $59 for Park and Ride spaces. I have a sickening feeling that some day too soon, we will all be paying a $40-a-year fee for the “privilege” of using a TAP card. Your $5.6 billion 2016 operating budget isn’t enough for you? Will there been a return to the halcyon days of 1995, when Metro officials ordered solid gold bathroom fixtures and traveled to Milan, Italy to pick out the marble for their offices in the Gateway Intermodal Transit Center, all on the dimes of the poor people who couldn’t afford their own transportation? I have a monthly Metrolink Train Pass with TAP capabilities. Can I TAP my monthly Metrolink pass at the bike kiosk? Am I eligible for the $20/month bike pass? Yes! You are definitely eligible to get the $20/ month bike share pass – it’s for everyone. However, Metrolink passes are classified as temporary TAP cards and cannot be used for bike share. Your best bet might be to get a new Metro Bike Share TAP card when you buy your pass at bikeshare.metro.net. The instructions for using a Tap card at the dock are incomplete. Please clarify the instructions for new pass holders. Message 4 above says: “To use a bike after purchasing a pass, simply tap a TAP card to the dock to unlock the bike.” It’s not quite that simple. First, you have to make sure that the Tap card that you tap is the Tap card that holds your Bike Share pass (yes, I know that should be obvious). Second, the instructions don’t mention that you have to push the button on the dock before tapping. Third, the instructions don’t mention that you have to wait a few seconds before the system will recognize your Tap and release the bike. If there hadn’t been a Metro employee at the dock I don’t know that I would have been able to figure it out before getting frustrated and giving up. Other than that, it was a good first day for the system. I have a senior TAP card. Can this be used and is their a senior rate? Yes, you can use your senior TAP card to unlock a bike. At this time, there are no senior rates but Metro is looking at student and senior rates in the future.